First of all, apologies. 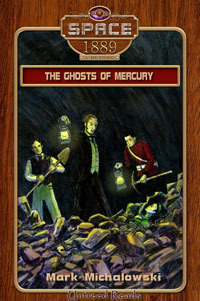 We were hoping to have ‘The Ghosts of Mercury’ released over Halloween, but a technical hitch to do with acquiring the ISBN has prevented us from doing so. The issue will be resolved soon, so I hope you’ll bear with us all in the meantime. So, a brief update of things relating to Space: 1889 & Beyond. First of all, as you can see, the cover has been unveiled. Once again it’s by the excellent David Burson, this time featuring Doctor Arnaud Fontaine, Corporal Paul Heath and, finally, in the middle, our hero, Professor Nathanial Stone! In related news, the author, Mark Michalowski, has released his brand new website, so why not pop over and have butcher’s at his other works. There’s also a new review of ‘Journey to the Heart of Luna’, from best-selling author of The Shadows Trilogy, Julieanne Lynch, which can be read here. Author of story #6: ‘Dark Side of Luna’, JT Wilson, has two short stories out today, in the anthology Re-Vamp, about which more can be read here. And, finally, a new addition to this blog can be found on your right. A list of all my professional works, which also happen to be links to places from which they can be bought (except for Sedna, which seems to be particularly hard to find). He was there. Again. Standing silently in the corner of the room. There but not quite there. When Corporal Heath looked directly at him, he seemed to jump, as if instantly whisked to some other part of the room that was now at the edge of his vision. Heath couldn’t help but still try to catch it out, hoping that, just once, the ghost might forget to jump. Heath ached—not only with the pain in his leg and ankle and chest, but with frustration. He had lost count of the number of times the ghost had vanished completely, and he’d found himself staring down at his white hands, balled up into fists, clutching the hospital sheets. He sensed something not altogether right, not happy about the ghost. There was a darkness there that he didn’t like at all. Realising how tense he was, Heath consciously relaxed and let his chin drop to his chest, triggering a jolt of pain from the torn muscles around his collarbone—before looking up suddenly, another bolt of pain shooting down his left arm from his shoulder. There was something going on in the corridor; he recognised Doctor Schell’s voice. The door to the ward was flung open and in swept the doctor, in his wake a slim, striking woman with black hair and the most hypnotic eyes Heath had seen for a long time. She had a healthy tan which immediately marked her out as a newcomer to Mercury. In her arms, she carried a large, buff folder, holding it close like it was the most important thing in the world. Behind them, hands flapping and a look of intense annoyance on her face was Nurse Lopez. She shot a glance at Heath as if to apologise for letting Schell and this new woman in. “Can’t complain sir,” Heath replied, knowing that an angel must surely have been looking out for him all those weeks ago. Schell turned to Nurse Lopez who stood there, glowering at him. By all accounts, Nurse Lopez’ parents—and in particular her mother—were possessed of fiery Latin temperaments that their daughter had clearly inherited. “This man is sick, Doctor Schell. I do not think you really need me to tell you that, do you? You are a doctor after all. He needs rest and time to recover, not being interrupted during dinner.” Her English was impeccable with barely a hint of a Spanish accent. Doctor Schell looked up and down the bed and at the side-table. There was no sign of any meal, either fresh or half-eaten. “You don’t have to apologise for not being hungry, you know,” interjected the dark-haired young woman who sounded, from her accent, like an American. She smiled at him and gave him a wink. Nurse Lopez pulled a sour face, looked Miss Somerset up and down as if appraising her as a potential rival—as women, in Heath’s opinion, were wont to do—and then turned on her heel and left, letting the door bang behind her as a final gesture. 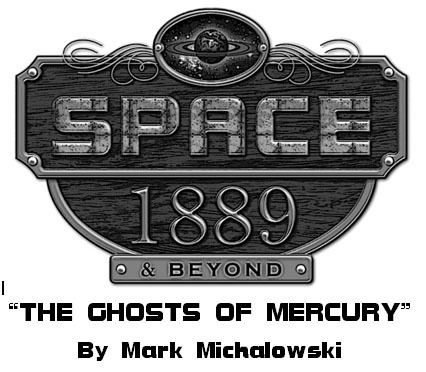 The Ghosts of Mercury by Mark Michalowski, soon to be available from Untreed Reads Publishing. 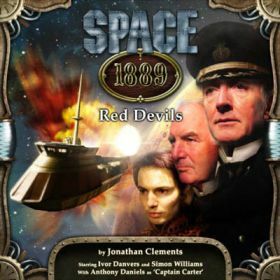 In the first of a two-part article, I shall be speaking to the creative minds behind Noise Monster Productions’ audio series of Space: 1889, the inspiration for the series that eventually became Space: 1889 & Beyond. JA: I think I was aware of Space: 1889 when it first came out. I was big Dungeons and Dragons player in my teens and, although I stopped playing regularly when I moved to London in my late teens, I did keep an eye on what was being published. Many years later I produced the Judge Dredd audio dramas for Big Finish and became aware that the authors were using the Judge Dredd role playing game books as their reference material for writing the scripts, rather than having to plough through thirty years worth of comic strips. This made realise that all RPG’s were ready-made ‘bibles’ for telling stories of any kind, and not just for gaming. JA: It was easy really. 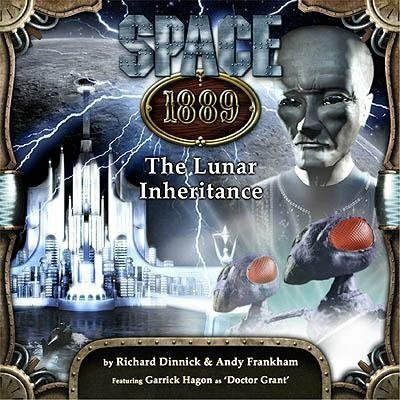 I bought multiple copies of the main Space: 1889 gaming book and gave one to each of my authors. I told them to write a story set in this universe. I wanted a large cast of characters that would populate the world. The intention was that they wouldn’t all be in every story, or wouldn’t always have a major role, but they would keep on cropping up as we progressed from adventure to adventure. This principle is evident in the Mars Trilogy, but unfortunately the forth release proved to be the last. Was that always the intention? JA: The intention was for the series to be an ongoing one, exploring the whole of the Space: 1889 universe with stories set on Mars, Venus, Luna, Earth and in space. I had a vague notion of bringing Queen Victoria to Mars on a Royal visit and was thinking of asking Pauline Collins to play the role. I was later amused to discover that she was subsequently cast in exactly this role for an episode of Doctor Who. So, someone was thinking along the same lines as I was! Talking of the end of the series, I asked John what he felt contributed to its demise. JA: Poor sales, plain and simple. It was quite a learning curve. I discovered that each time I released a new CD, the previous ones would sell as well. If that trend had continued, it would have begun to break even after around twelve releases. Unfortunately though, I didn’t have the funds to keep the series going that long without seeing any return. 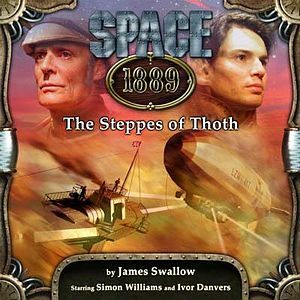 At this point I wondered, what with the growing popularity of steampunk and Space: 1889, would now be a good time to return to making audio dramas based on the property? JA: Possibly. To be honest though, I think you’re only going to get really healthy sales from audio dramas that are based on popular, existing franchises that already have a large fan following like Doctor Who, Star Trek or Star Wars. However, if I was to produce further Space: 1889 audios (although I have no plans to do so), I would release them as download only titles. This would greatly reduced the production costs as pressing CDs, printing covers and postage and packing is a very costly part of the business. Looking back then, five years on, I wondered what John would consider his proudest moments as producer of Space: 1889. JA: To be honest, I was proud to have done it at all. I thought all four titles were really good and Alex Mallinson’s graphics and art were exactly what I wanted. I was particularly pleased with the casts who I thought were excellent and did some really good work. JC: I think it’s the sense that the Victorian period is *already* science fiction. There isn’t all that much difference between Mars and Africa or India for the Victorians, and there is this incredible sense of progress and adventure. It’s fashionable now to regard the Victorian era as one of exploitation, folly and imperialism, and even in my script, there were elements of doubt about the justification for expansion and colonialism, but Chadwick’s original has a sense of exuberance, a sense of fun about it. And what difficulties did he face converting the RPG into a script? JC: Bottom line: sentences are longer. Victorian speech patterns are entirely different to our own. Only the servants talk remotely like we do. The upper classes have a literate, sedate, loquacious consideration to their speech, which made my script 10% too long on the first draft. But I came to love the luxury of being able to think aloud in speech. You can’t do that with modern manners — everyone always interrupts each other. As authors we all have favourite characters, so when asked who were his, Clements was quick and to the point. JC: The Professor and his daughter Georgina. Fair enough, and I have to agree. So, just to task him a little more, what would be his three favourite moments from Red Devils…? JC: Georgina rustling around the Professor’s cabin and asking him if he’s awake. And then there’s a pause…. which turns into silence… and then he says “No”. Ian Brooker’s finest moment, not for what he says, but for how long he waits to say it. Georgina kicking off the resistance by slapping the pirate leader. It harkens back to an observation I made about Viking sagas, when if you actually look at the original text, you see that a lot of battles begin when women goad their menfolk into action. In ending this first part, then, I ask Clements what’s coming up for him, for I know he’s a very busy chap. I’ve written the first of the novel spin-offs from the TV series Spartacus: Blood & Sand. It’s called Spartacus: Swords & Ashes, and it will be published in January 2012. A very different kind of speech pattern from the Victorian age, but just as intricate and just as much fun to work with. Well, that’s great! I’m glad it’s considered part of the wider Space: 1889 universe. Many thanks to John Ainsworth and Jonathan Clements for their time. Exclusive Space: 1889 & Beyond News! Hey, just a brief update, with some exclusive news on Space: 1889 & Beyond series two. As mentioned in the previous post, series two will feature stories by Frank Chadwick, Mark Michalowski and myself. The details are thus; Frank Chadwick and I will be joining forces to pen the opening novel, entitled “The Conspiracy of Silence“, which will shake the universe of Space: 1889 to its core. Mark Michalowski will be writing the fifth story in the series, a novella set entirely on board an aether flyer. Other authors will be announced in due course, but lest we forget, the pitch-period has yet to close and so who can tell what kind of talent will be contracted for series two? Either way, I’m seeing some exciting pitches finding their way into my inbox at the moment. The series, itself, will consist of seven stories, released bi-monthly from February 2012, featuring three novels (start, middle and end of the series) and four novellas. In the meantime, series one is spreading out there nicely, garnering some very favourable reviews. It’s always fun trying to find new ways to promote the series, and one of those suggested was a trailer on Youtube. A fantastic idea, alas not one I had the wherewithal to implement. Luckily, though, I have some clever friends and writers on my side. Mark Michalowski, Doctor Who author extraordinaire and author of the forthcoming novella, ‘The Ghosts of Mercury‘, came up with a solution. And a strictly non-profit trailer, with a little help from Koch Entertainment! You’ll agree, it pretty fun, yes? The dramatic music completely sells it, in my opinion. Please do like it, and spread the word. The series is already performing well, with the first book rating as the second best-selling release from Untreed Reads in September; on the back of that success the second series has been green-lit by Untreed supremo, Jay Hartman. I am already deeply involved in plotting and planning series two, with pitches coming in from a whole host of talented authors (if you’re one such author, then please contact me at frankhamallen@untreedreads.com for the series two guidelines). Although no contracts are signed, I can confidently say that we will be seeing another story from Mark Michalowski and a series opener co-authored by Frank Chadwick and I. 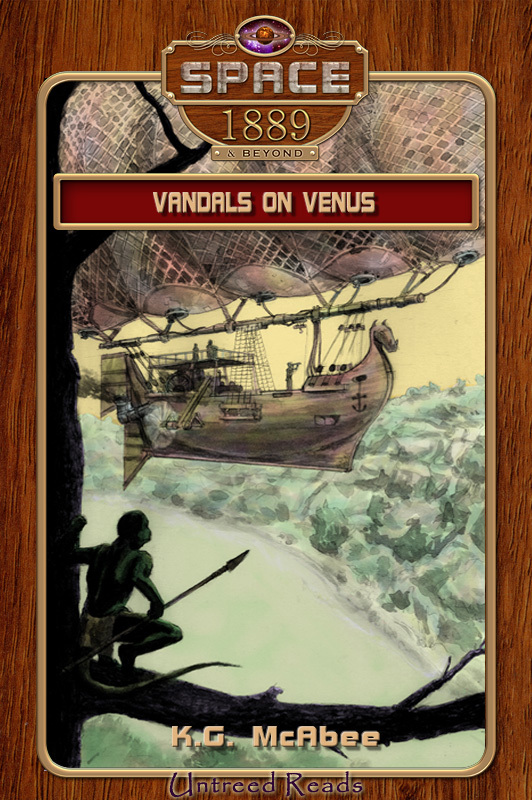 Out now, from Untreed Reads Publishing, book two in the all-new Space: 1889 & Beyond series, Vandals on Venus by K.G. McAbee. When Nathanial Stone gets an emergency message from an old friend on Venus begging for his help, his duty is clear: he must go at once. His ward, Miss Annabelle Somerset, instead of agreeing to stay safely on Earth as he begs, insists on accompanying him to the dangerous tropical planet, home of huge reptiles. Soon, Nathanial and Annabelle find themselves in the middle of a plot concerning a nefarious German officer, a brilliant English inventor, an Irish guide no better than he should be, a heavily-armed lizard-man and a clever American newspaperman. Can even they prevail against such odds? I recently interviewed K.G. for the forthcoming official Space: 1889 & Beyond website, but since that site is slightly delayed, allow me to share with you her answers here. 1) What interested you in Space: 1889 & Beyond in the first place? I’m also a serious fan of the classic pulp writers: ERB, Lovecraft, REH, and the science fiction writers who got their start in the pulps: Heinlein, Clarke, Asimov, Eric Frank Russell, Jack Vance and so many, many more. The pulp feel of S:1889 is so attractive to me as a writer and as a reader. Did I mention I was a geek? 2) What difficulties did you face in converting a Role-playing Game scenario into a fully-fledged prose novella? Well, let’s face it: RPGs depend on the players to flesh out their characters, but in a novella, it’s up to the writer to make the characters live on the page. There is also, in the game, the automatic collaboration between the players, which can change and morph the events in unexpected ways. I provided a general outline of my story, but it too changed and morphed as I wrote and as I became more familiar with people, places and events. I hope I’ve managed to make my characters alive and recognizable, with all their human strengths and weaknesses intact. 3) Who are your favourite characters? Oddly enough, even though he doesn’t appear very much, in my story at least, I’m especially interested in William Henry White, warship designer and head of naval construction. I am fascinated in the sheer depth and complexity of just the idea of designing a warship. 4) Your three favourite moments in Vandals on Venus are…? 1. When Nathaniel is convinced, and I mean CONVINCED, that Annabelle will not possibly go to Venus with him. 2. Annabelle’s anger and disgust at Nathaniel during a rather explosive moment, about which I shall not say more. 3. Dinosaur attack! Of course! 5) What’s coming next from you? How nice of you to ask! I have a steampunk short story series contracted with Untreed Reads called Bold as Brass. Each short tells one of the adventures of Lady Abigail Moran, an aristocratic thief—think A. J. Raffles in skirts—and her trusty sidekick and less-than-aristocratic associate, Simon Thorne. The first in the series is called “Lady Abigail and the Audacious Aeronaut” and then comes “Lady Abigail and the Lachrymose Leviathan” and “Lady Abigail and the Morose Magician”. These are lots of fun to write. I also have a steampunk collaboration, written with Cynthia D. Witherspoon—we write as Cynthia Gael—coming very soon from Carina Press, which is an e-division of a little publisher called Harlequin. Our book is called Brass and Bone, and we’re working on the sequel now; we’re hoping it’s going to be a series. Also, I’ve just signed contracts for two short stories for upcoming anthologies, one from Wicked East Press and one from May December Press. I’m in talks to collaborate on a mystery with another S:1889 writer, the brilliant Louis Shosty. And I’m working on a project with zombies—but then, who isn’t? Nathanial’s heart sank further and further within him as they approached the airship Forbes-Hamilton so vaingloriously called the Aeronaut III. From a distance, the airship had looked very much like any other on Earth, but as he grew closer, he could begin to pick out a multitude of differences. Instead of a single oblong cigar-shaped airbag, this ship had a series of—he counted silently—five round balloons, all contained within an elaborate crisscrossed netting affair, which seemed to be woven of some local vegetable matter; a thick, fibrous yet porous looking vine. Below the five entrapped bags hung the gondola. Here again, Forbes-Hamilton had departed from the accepted Earth style. Instead of sleek and aerodynamic design, the inventor had gone for a fantastical look. Stone did not approve. There was no place in engineering, in science, for such a ridiculous object. Why, the thing looked like some sort of Viking ship, with its raised prow and stern, and a silly lizard head which, no doubt, was meant to represent some sort of mythological beast, a dragon or wyvern. As for the state of the thing! The airbags had patches, which were themselves patched, and the ramshackle gondola looked as if it had been knocked about like a cricket ball. “Oh, it’s hardly lovely,” Forbes-Hamilton said, twisting one foot like a child in obvious pleasure at Annabelle’s words. “Though, I must admit, it is rather unusual, is it not?” He raised his head and beamed up at the thing as if it were the most beautiful craft imaginable. “Unusual. Yes, indeed,” Nathanial managed at last. He turned and glared at Jericho, but even that release was denied him, for Jericho was at that moment grinning like an idiot at Annabelle. Somehow, Nathanial doubted it. But he was here, and Annabelle was safe and not too terribly troublesome, so he might as well make the best of things. He followed Forbes-Hamilton around the prow of the risible ship. For an instant, he was sure he had run into the same dragon whose head adorned the prow of the Aeronaut III. A massive figure stood at the bottom of the gangplank. It had long muscular arms ending in seven-fingered hands, each finger tipped with an inch-long claw. The legs were bowed, with flat splayed feet, each of the seven toes also tipped with a claw. The barrel-shaped torso was hung and strewn with weapons: a two-foot-long knife hung from a mottled leather belt on the right; on the left hung a bulbous war club with a leather cover; and the handles of two throwing spears projected above the shoulders. A round convex shield leaned against the edge of the gangplank, painted with a grinning face in lurid colours, next to a vulcanised bag with a drawstring top. But the thing’s head! There was the image, the very mirror image, of the dragon on the prow of the Aeronaut. A long snout ringed with double rows of triangular teeth jutted out from the lumpy cranium. Two small eyes, as green as glass, gleamed beneath spikes. And the most amazing thing of all: a deerstalker hat sat atop this mythological reptile, as though the thing thought it was a character in a Conan Doyle story in the Strand Magazine. Nathanial watched in amazement as that long, tooth-filled mouth opened and the beast spoke, in a sibilant voice, almost as high-pitched as a young girl’s. “How fascinating,” Annabelle breathed as she gazed up the long length of the lizard-man, who towered over her like a giant. Then, to Nathanial’s amazement, and fear, she held out her hand. Thymon looked down at her, lowering his massive snout like a drawbridge, a quizzical expression in his deep-set eyes. He held out his huge paw and, with the utmost care, gave the top of Annabelle’s small, decidedly grimy hand a delicate tap with one razor-sharp claw. Nathanial released a breath he hadn’t even known he was holding. Annabelle, he feared, was going to be the death of him. Vandals on Venus is available direct from the Untreed Reads Store (currently on sale as part of the World Space Week, for only $2.09), and from all good eBook stockists. 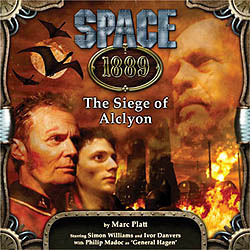 Space: 1889 remains the copyright © of Frank Chadwick, and is used under licence. Artwork by David Burson, cover design by Steve Upham, copyright © Untreed Reads LLC, 2011. All Rights Reserved.